Yes, you read that correctly. I’ll just give you a moment to get back into your chair, fan yourself, whatever it takes. 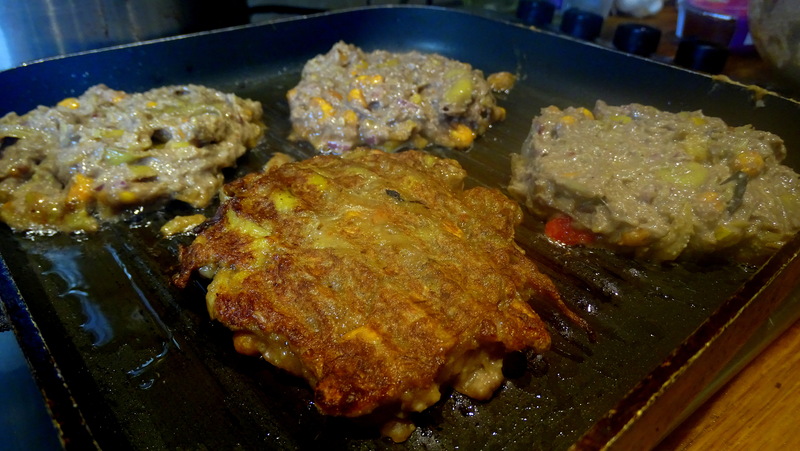 The other day I was wondering what kind of savoury food could be made using pancakes…what I uncovered was something far stranger than I ever imagined. Bizarrely, something about the banana peel in this manages to do a pretty valiant job of replicating the appearance and texture of beef. However, I will tell you this – I made a few key mistakes which held these burgers back from being the best they could be. What you’re going to read is my recommended recipe here – something that will give it a more bbq, meaty feel. Do as I say, not as I do. Of course, this is on the assumption that you’re going for a beef sub. This could quite easily be enjoyed for what it is, in which case leave out the BBQ sauce and enjoy the sweet, subtle taste of banana in these potassium and protein filled patties. A few spoonfuls of smoked Paprika/other meaty-beefy flavouring herbs and spices. 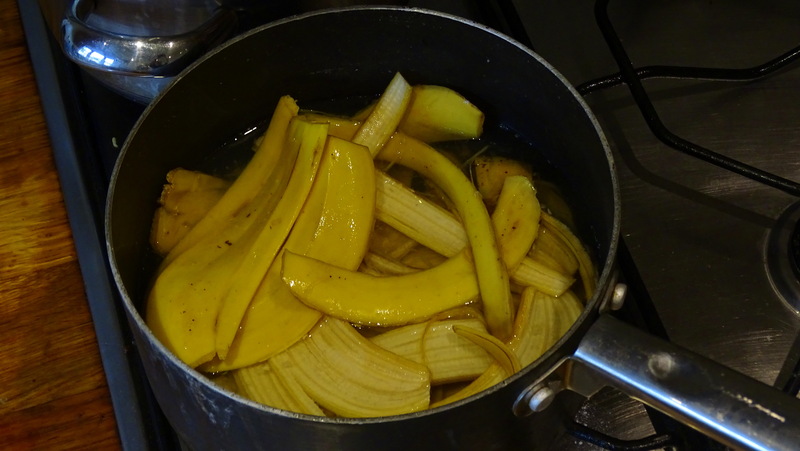 Boil your banana peels for around 7 minutes to soften them up nicely. 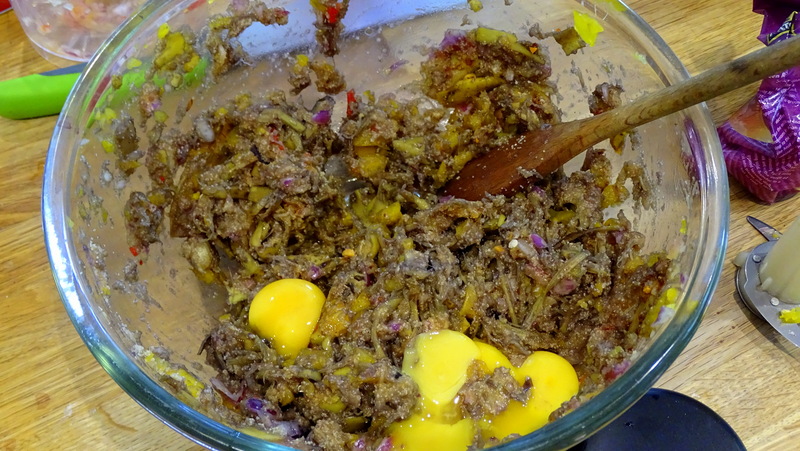 Add the chopped pepper, diced onion, chili, egg yolks, BBQ sauce, seasoning and semolina. Mix together well and behold the brown-grey sludge you have in front of yourself. Trust and believe, this will work. 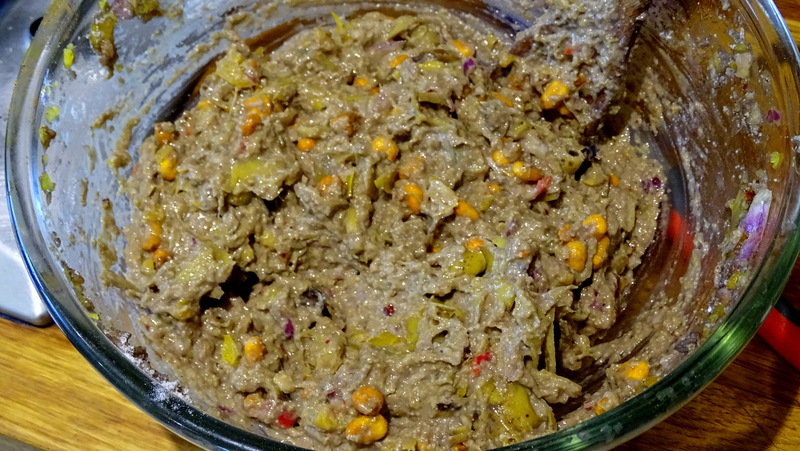 Add a tablespoon of flour at a time and mix through until your mixture has bulked and thickened to look like this. Don’t push it too far or you’ll end up with something more doughy than meaty. This was maybe 3/4 – 4/4 cup. And please, stop despairing, this will work. These will not form into patties, they’re too wet. Instead, spoon a large scoop into a hot pan of oil and with the spoon gently press down and make patty shaped. These will seal up and hold together pretty quickly – flip every couple of minutes until suitably browned. It’s a burger, you can really make your own decisions. As this is quite a savoury-sweet dish, I opted for a relish to balance things out, as well as some sun-dried tomato hummus. Both were delicious, but I’m sure an old-school ketchup/mustard combo would work too. 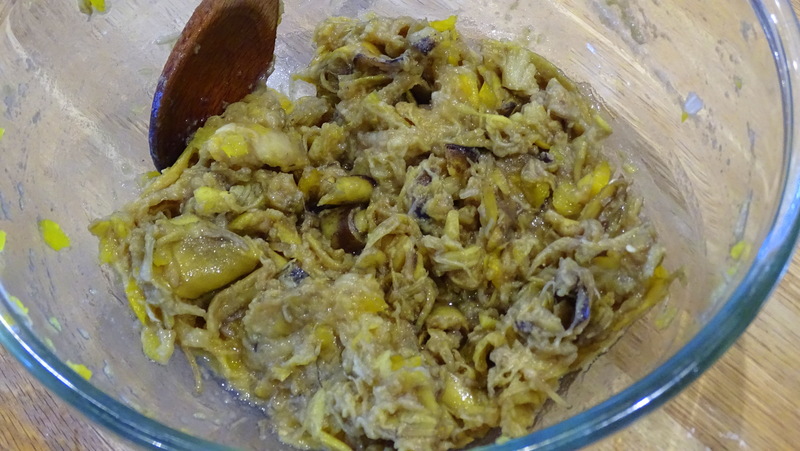 Posted in Guesscipes, Mains, VegetarianTagged banana, banana peel, barbecue, barbeque, bbq, burger, cooking, food, guesscipe, healthy, low fat, meat substitute, recipe, summer, VegetarianBookmark the permalink.